The Musings of a Book Addict: New Years Resolution "PERSEVERE"
This year promises to be a great year. I choose to believe this no matter what may happen. Following several other people who choose a word to help define or guide their life for a period of time. I have chosen the word persevere to be my word for 2016. 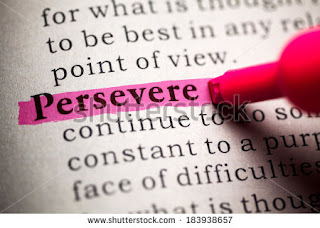 Persevere means to persist in anything you attempt no matter how difficult, no matter what obstacles get in the way. You just keep going. I will persevere in my quest to revise my current work in progress and get it published. I will persevere in my quest to finish two other works that are half finished. I will persevere in my quest to complete the picture book I was creating with my grand-daughter. I will persevere in my quest to lose weight because I will be having double knee surgery this summer. I will persevere in my quest to be as prepared as possible to the new school year before it begins. I will persevere in my quest to complete my reading challenge of 150 books this year. I will persevere in my quest to read the Bible through this year.